The Cochin Natural History Society is a non-profit making, non-political charitable institution registered under the Travancore-Cochin Literary, Scientific and Charitable Societies Registration Act, 1955. This is a society of amateur naturalists who live in harmony with nature and seek to protect and to preserve the biodiversity and healthy natural environment. The mandate of the society is to undertake studies and documentation of biodiversity around us and to draw attention to the aesthetic, economic, scientific and conservation aspects.The society also intends to provide a platform to those who are concerned to come together and share, enlarge and correct our knowledge about Nature and its magnificence. Any person, who has a love, interest and commitment towards conservation of our biodiversity and natural history may become a member of the society*. So let`s look at the bird and see what it`s doing --that`s what counts. I learned very early the difference between knowing the name of something and knowing something." There are 54 species of birds recorded from RECCAA Enclave,Padamugal, a residential area in the suburbs of Kochi. This shows there are many such beauties lurking in our backyard. Video by Sri. 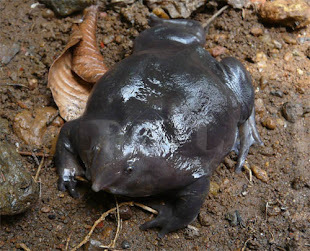 Sudhakaran K K.
Indian Purple Frog is a relatively large burrowing frog with a distinct, bloated appearance. Endemic to the Western Ghat Mountains (Sahyadri Mountains) - which conservationists consider a biodiversity hotspot. In Sanskrit, nasika means "nose" and batrachus means "frog," while Sahyadri refers to the location where this species is found. The blackish-purple ‘living fossil’ looks like a bloated doughnut with stubby legs and a pointy snout. Its closest relatives hang out in the Seychelles, a group of islands 1,900 miles (3,000 kilometers) away. The species Nasikabatrachus sahyadrensis is estimated to have originated in the Jurassic, 130-180 million years ago. Little has been published about the life history of Nasikabatrachus sahyadrensis; it is rarely seen. N. sahyadrensis is fossorial (adapted to digging) and comes to the surface only for a few weeks a year to breed. Human pressure, primarily from agriculture, has reduced forest coverage and dam projects in the Western Ghats threaten large portions of this frog's habitat. This photograph was taken at Ernakulam on 24th May 2012. > Birding Tour for new comers to be organised by CNHS. (Edamalayar-Bhoothathankettu birding trip conducted.For more details, pls. see BLOG ARCHIVE, Dec 5-12 and also right panel). > Pelagic Bird Survey in Ernakulam! To see Preliminary report of "Survey of the Bird Diversity of Malayattoor Forest Division, 2011", CLICK HERE. To see "Report of the Bird Survey Camp" conducted by CNHS team at Pambadumpara, Munnar, with the support of Kerala Forest Department, February 2010. This PROJECT is open to everybody (Both contributers and followers). Just click the "Click Here" button at the end of the above sentence and enter your details of observation in the exel worksheet which opens. You can save your entries and return to blog home page afterwards. We request your cooperation and the data you provide will be duly acknowledged.What you have to do is to watch market places, grocery shops, other buildings etc., for the HOUSE SPARROWS and note down (or memorize) the particulars like the observation date, time, place, nest site if any, number of male, females and juveniles, total number of birds, Activity involved, name of observer etc. Then just post your information in the CNHS blog as mentioned above. Every datum you provide will be of immense scientific importance and we once again request your participation in this very special project. Click Here to Download the Application Form Please Contact Secretary(Vishnupriyan Kartha -9446437410) for further details and submitting the Application Form and remitting the Fees etc..The Membership of the Society is subject to the approval of the Executive Committee of the Society. Bangladesh, Cambodia, India, Nepal and Pakistan, sharing the goal to identify and implement the priority actions (based on scientific evidence) that are urgently needed to conserve Asia’s CriticallyEndangered vultures. Click Here To Download . Courtsey:- Bird Count India. This has been compiled by the Birdlife International. This is a House Sparrow monitoring project by MoEF,BNHS,NCBS and NCF.